"Are we ready clocks ?" You can e-mail comments to me here. who this JROK character is ??? Last Update Dec 20th 2018 !! Dec 20th 2018: MSF v1.04 board + BZF v2.1 board updates ! Latest version of the Mylstar compatible 8088 all-in-one PCB and the Berzerk & Frenzy all-in-one. Both now have VGA connectors making it a bit easier to plug into VGA monitors. www.arcadeshop.com will be selling the boards ! Also coming up before the end of 2018 ! 52 and 53xx custom IC replacements. 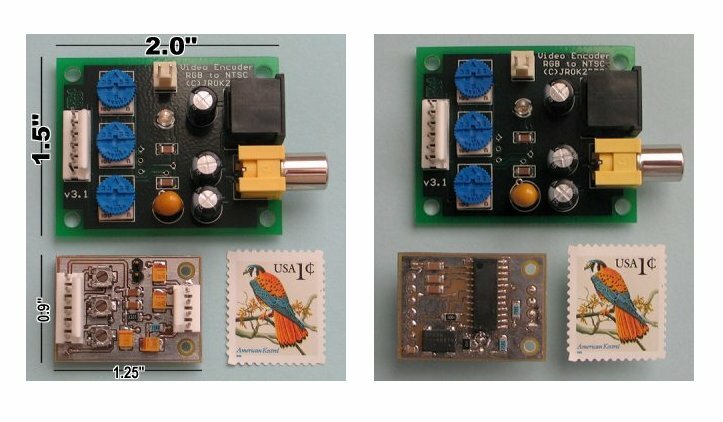 June 10th 2017: New Revision of the wSYSFPGA board ! 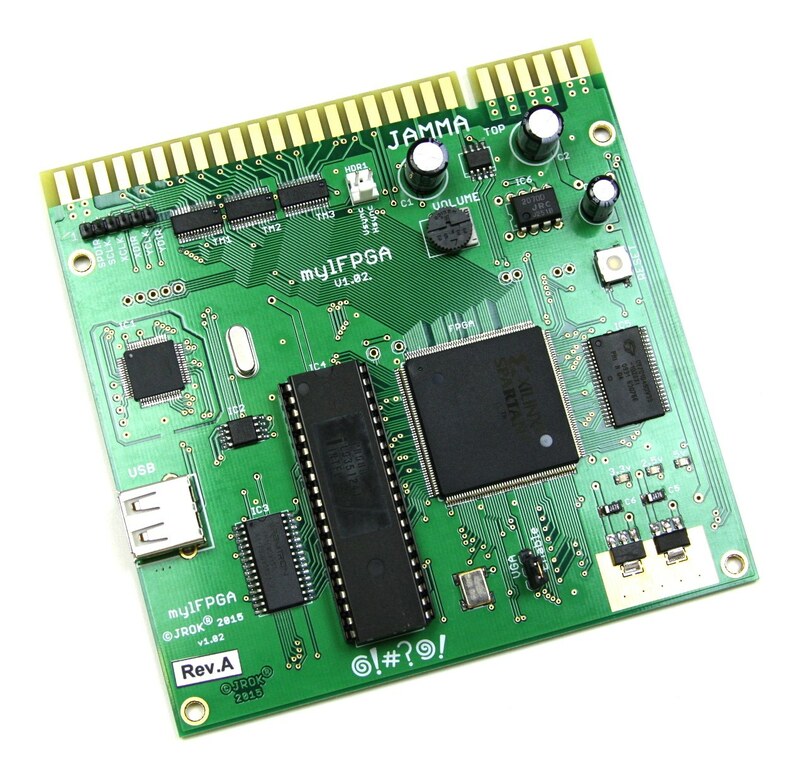 Version 1.31 of the 6809 based wSYSFPGA board now with a VGA connector to make monitor hookup easier. 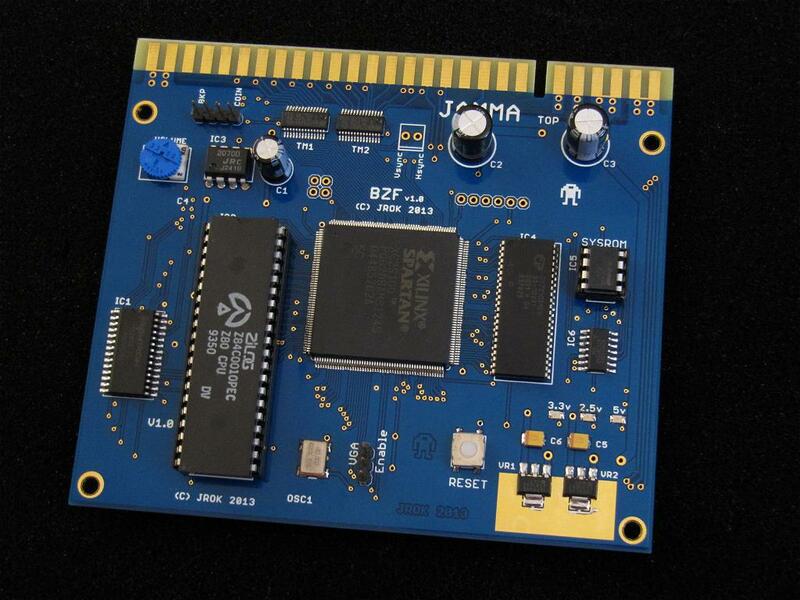 The latest firmware for flash updating the MSF boardsert ! V1.08 fixed a text corruption and contains the updates to help center the image on a 19" vision pro CRT monitors. It FINALLY happened, or at least after half-a-dozen hardware versions it eventually made it to a production version. The board is available from http://www.arcadeshop.com along with cabinet adapters. The production quality board came out beautiful in blue ! The BZF name comes from BerZerk and Frenzy. So it looks like it's time to get to work on the next project ! Time really gets away... Finally pics of the prototype BZF Berzerk (Berzerk) & Frenzy-all-in-one PCB. 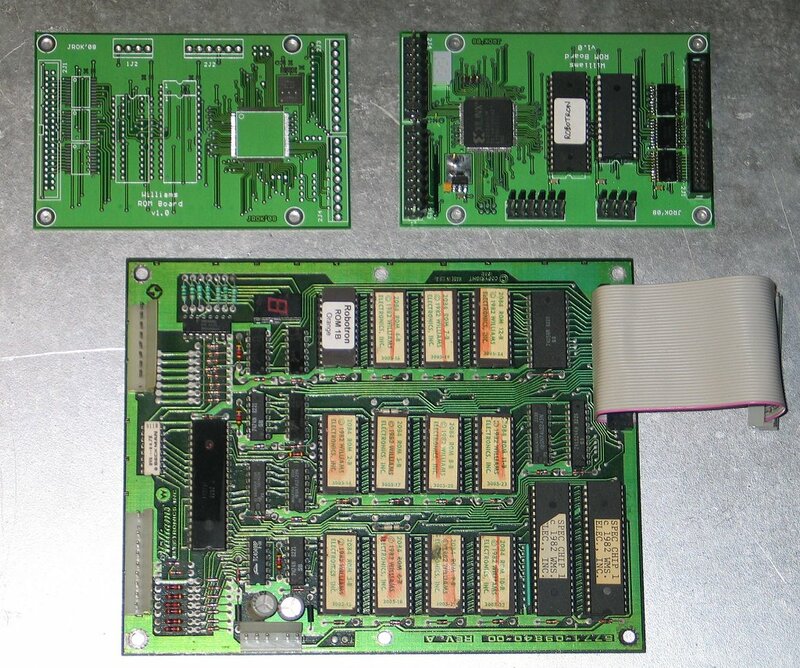 Berzerk boardset and with the correct adapter plus into the original harness. Alternately it can be used to restore converted cabs back into Berzerk. Also need to document the Battlezone mini-rebuild and convert the site maintenance over to Dreamweaver. October 22nd 2012: Neck Boards & Controls ! CRT monitors are just too much fun ! However missing a neckboard for a 29.1mm tube is a pain, so I had to clone one for a Wells 19K7689 monitor. A few parts from a 22mm neckboard were donated and a layout very similar to the original board was put down. In tribute to the original curved traces were used to preserve the feel of it. Building & etching a clone of the P448 neckboard. The rotating monitor dynamo cabinet ! I might be old or something, but I do like 19" monitors. The new shrunk version of the WSF board is under final test, it's been reduced in width by 1" and now measures 4.5" x 4.5". So a picture of the new board in all it's grubby test glory, System FPGA v1.1 shrunk prototype board , which includes goopy flux around the sound chip and missing headers for the 49 way stick, extra buttons and H&V sync headers ( all would be in place on a production board ), and the programming lead blocking part of the picture. These are for the video "sync-cleaner" boards, that take a standard def. composite video sync and 'clean it up' to output a 5v CMOS level composite sync with a more accurate NTSC spec horizontal sync duration. Some video encoders and TV's disable color burst when the sync duration is out of spec. They also help clean up problems with boards that output really long H-sync pulses. March 26th 2012: Wow ! JROK Industries is a reality.... time to do something very different for a change. Website really needs a makeover.. It's a bit 2009 ! 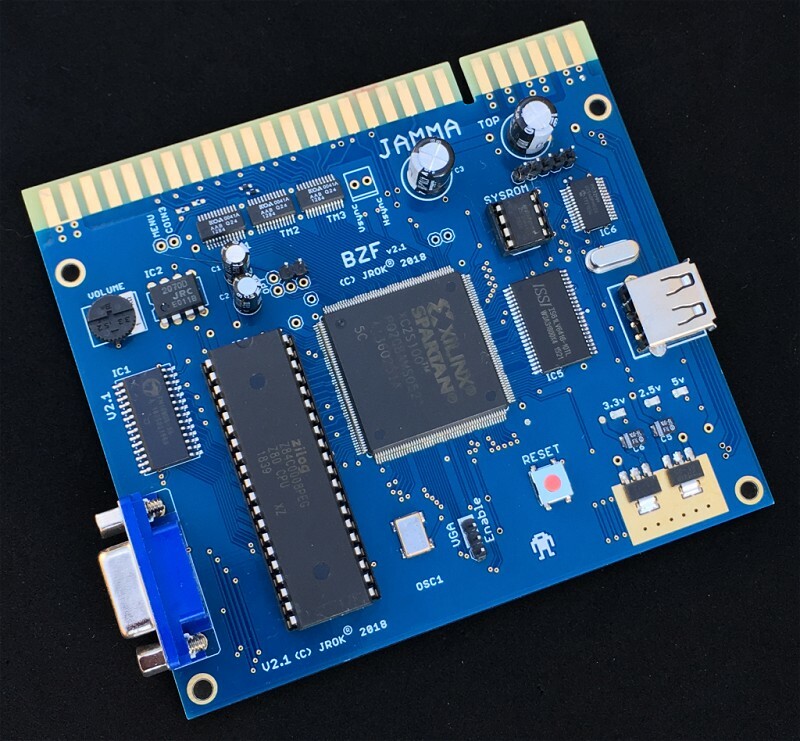 There are about 1,000,000 projects that need to get attention, including runs of the FPGA boards, video encoders/format converters, custom IC's and lots of other parts that can get the attention they deserve. Wicked parts PIC32 - M4K MIPS what's not to love ? July 26th 2009: Finally an UPDATE !! Video Stuff... encoders are in stock along with the gold Phono's over at the RGB Encoder & Component Encoder pages. 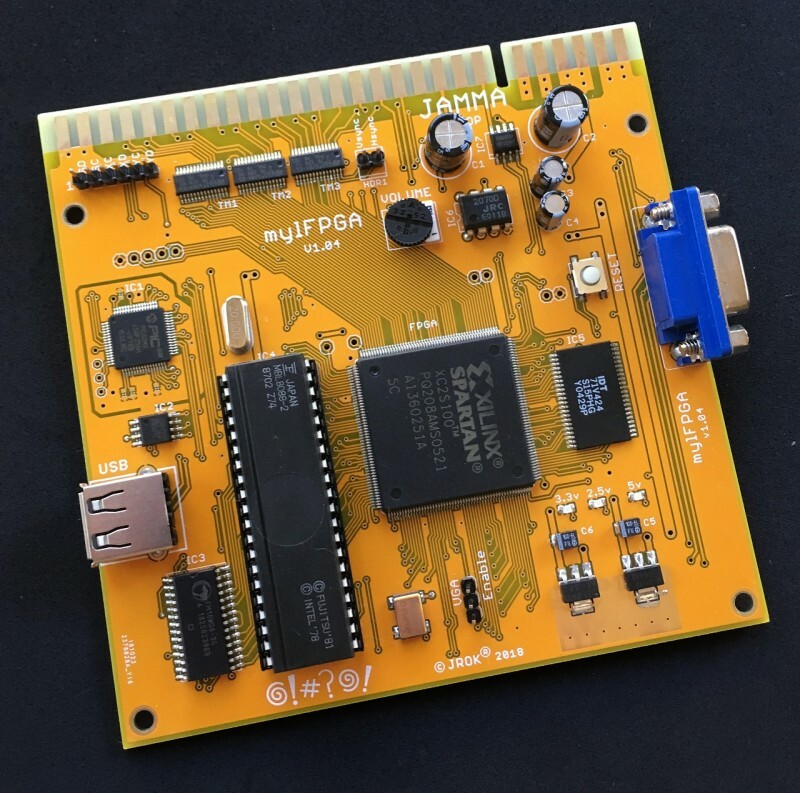 Building an 8088 based gameboard that support Q*Bert / Mylstar hardware with an FPGA handling all video and assorted board functions. Here's the current state of the project Mylstar System_FPGA ( MSF ) board work-in-progress. 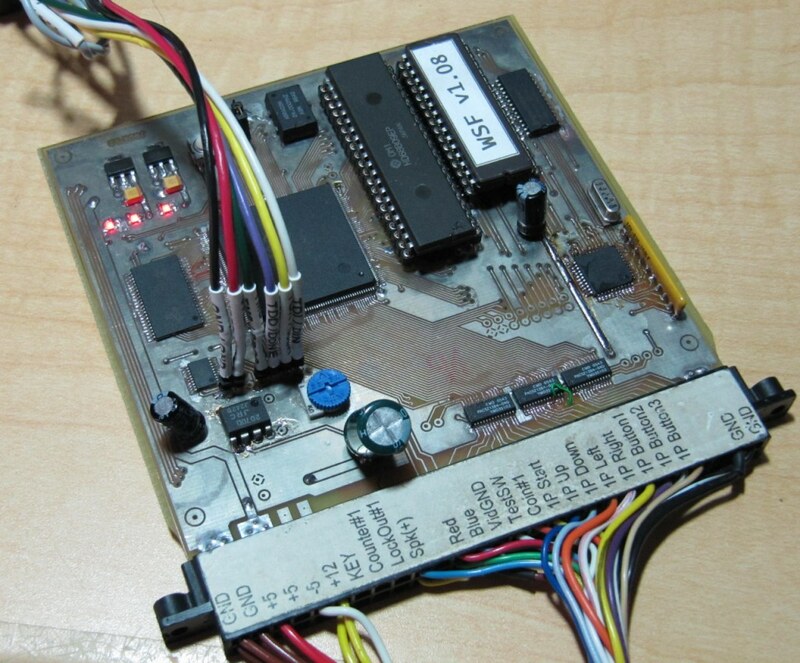 The prototype is based on a left-over W.S.FPGA board with an adapter to fix an 8088. Developing the sound support for the MSF board, which will be emulated in an Atmel AVR part, most probably. The original soundboard is basically just a 6502 hooked up to an 8-bit DAC for making audio effects... oh with a Votrax speech IC for extra annoyance ! Wow.. did I ever fall behind on the updates. May 31st 2008: Etching fun ! 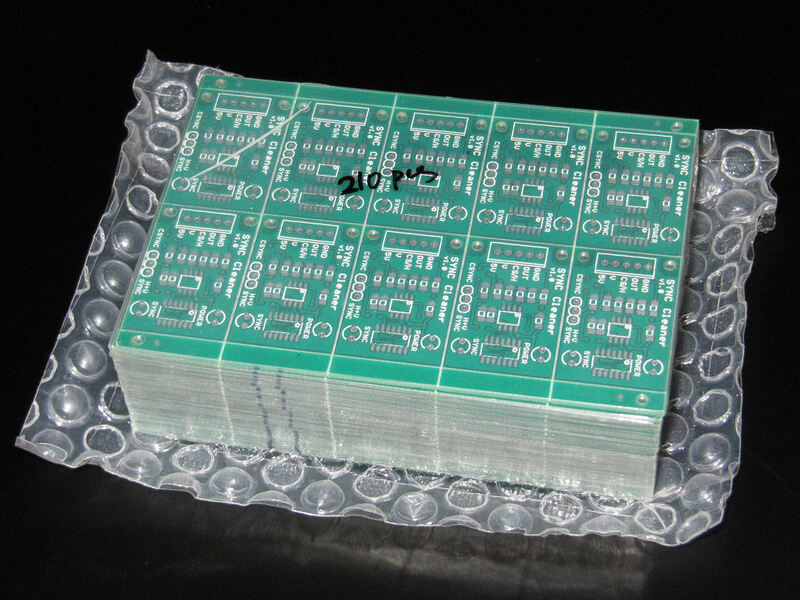 Time for some crazy home PCB etching... Etching a printed circuit board using MG Chemicals Photofabrication Process for a 208 pin QFP package with 0.5mm lead spacing. Soldering these things is a bit tougher than a DIP package tho'. Results came out very well for a double sided prototyping kit etch with10mil features. The result is a PQFP-208 bare board. This is ultimately for a FPGA carrier board I can do some experiments with during the next month. Based on a GAL22v10 a full repro of the AM25LS2519 used on some Sega boards, and the Bally/Midway license of Up'n'Down. Mar 31st 2008: Some ROM boards. Feb 29th 2008: Happy Leap Year Day..
Update on the next piece of my WMS projects. Some pics of the proto board that's been under test. A Williams soundboard like no other. I will be releasing the MC6800 emulation core which I wrote for the Atmel ATMEGA8 as freeware, once the source is cleaned up a little. 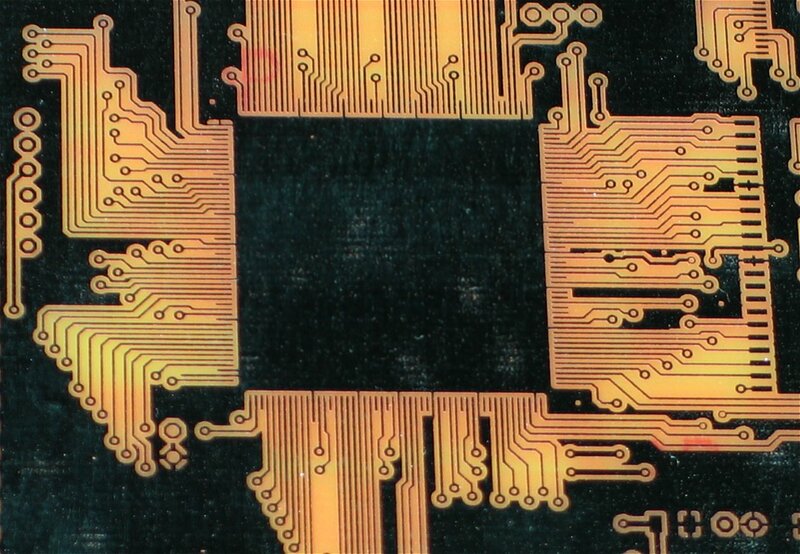 Next up I'm looking at the HC55564 CVSD chip, originally from Harris, which was used for sampled speech playback. 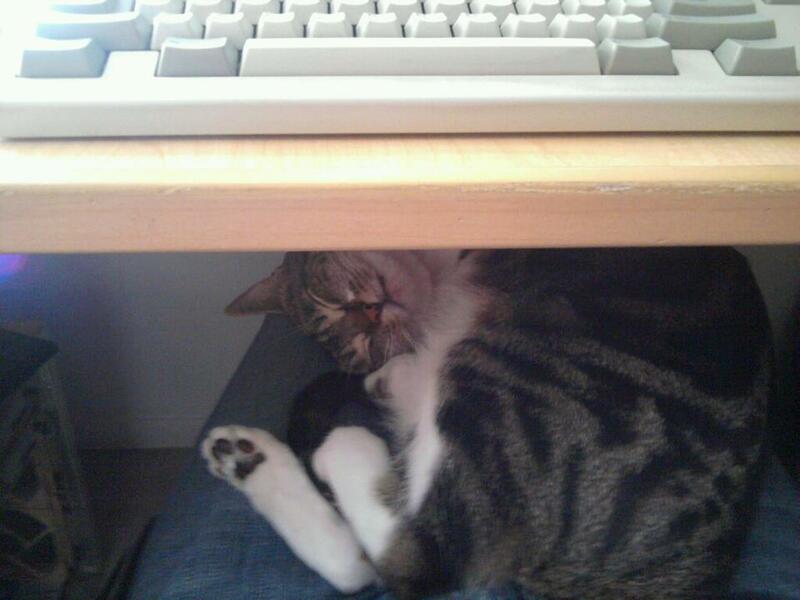 Harris provided some very useful application notes which makes writing a software implementation go more smoothly. Details of the project I've be working on since the end of last year, basically building compatible CPU/Video and ROM boards for the early Williams games, here's the details of the progress so far Williams Arcade Hardware. Jan 14th 2008: A new year !! & Williams projects ! A new year.. what happened to 2007 ? Well... I'm still messing with Williams gameboard hardware, which is really fun. You can't play too much Defender or Robotron. The Motorola 6809 was a great CPU and it interfaces nicely with Xilinx parts, a strange marriage of 1970's and 21st century parts. This was a project I undertook to replace the I/O Widget board for Defender. The original used a 6821 Peripheral Interface Adapter, with some additional logics. The design goal was to build a functional replacement that implemented just enough of the 6821 in a Xilinx CPLD to make it work. So now it is all working full details + source are available. More stuff for Rampart (!) 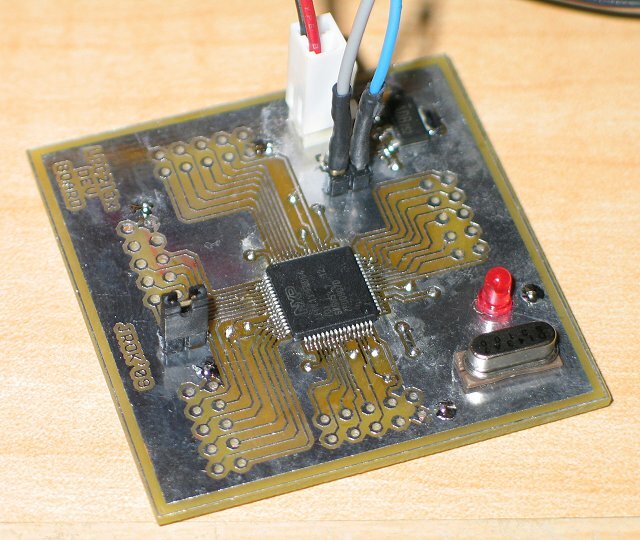 Although this will work with other Atari boards that use the LETA chip. This is a Atari custom optical encoder interface, for use with trackballs, spinners and to quote the off-the-wall manual, a 'Whirly-Gig'. It's used on both the joystick and trackball version of Rampart. About a year ago I reversed the logic for one of the SPLD ( simple programmable logic device ) for an Atari Rampart board that was missing the part. As a follow up I recently had a request for help with replacing two other GALs on the board. After some quality time with an analyzer here are working replacements for the part # 136082-1006, 136082-1001 and 136082-1056. Jul 4th 2007: The Pengo Obsession Continues & Happy 4th of July ! Well this should have been the June update (!) So I got ahold of clone Pengo boardset that was missing the 25LS2519, not exactly a common part to find, so it was time to build a replacement. So, here's the quick project with schems and pcb layout for anyone who wants to try making their own Pengo IC74 / U74 replacement am25ls2519. Note: This also works on an original Pengo boardset. Ready at last.. all known bugs are squished like sno-bees under an ice-block and all pre-orders have now shipped.. There's also still the free pengo high-score patch Pengo high score save. Apr 30th 2007: ZX-Spectrum Forever ! Feb 28th 2007: Custom 54 Noise IC ! 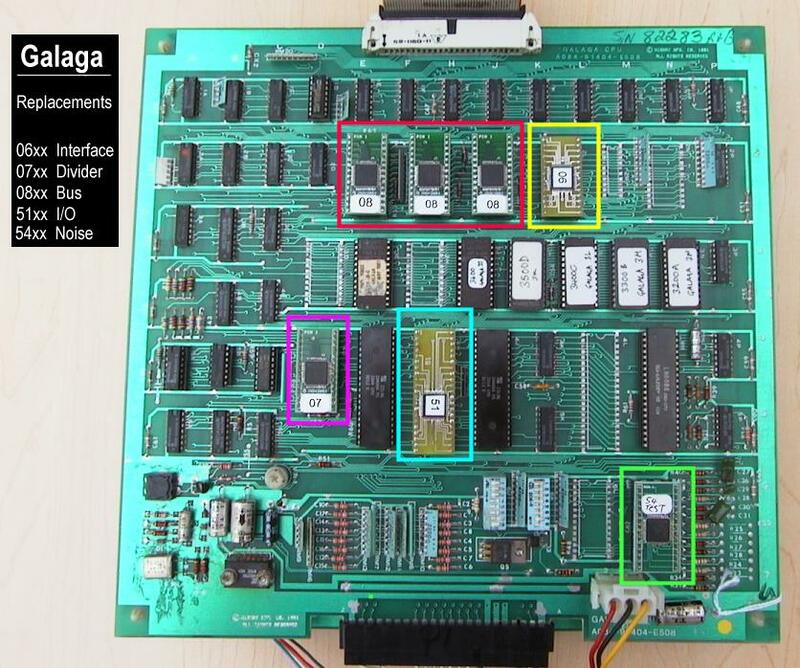 Now this is cool, the MAME folks have dumped the intenal ROM from the Fujitsu micro-controller used to generate the noise sounds on Galaga, Bosco and Xevious ! So apart from being a really excellent thing to do for the emulation of these games, having the original ROM available helps me complete the long procrastinated replacement for the 54xx. Mr.Do's Castle high-score saver ! Patches and details for the 3 different versions of the game. High Score Saver for Mr. Do's Castle ! Jan 1st 2007: What happened to 2006 ??? Will I manage an update a month this year ?? Added a new page with the wiring diagrams and mounting templates for both the v3 and v4 encoders. Also the dimensions and wiring for the panel mount s-video and phono connectors, along with how to hook up panel the mounts for the both the encoders. PCB's for the sync-cleaner boards arrived. Made a few up for testing and all is working as expected. They'll help clean up the video sync for games like Golden Tee 2K which can have real problems with some TV's. It's designed to help with the compatibility between games and TV. It work by taking the sometimes whacky video sync from a gameboard and outputs a nice clean CMOS level composite sync with 'standard' precise H + V sync width durations. This board also has the option of being able to take separate H + V syncs input and output a composite sync, again with standard sync width durations. This works really well with Q*Bert. Sep 5th 2006: Vectors Rule !! Custom 03xx completed..
First pics of my Random Scan, aka, XY vector monitor, complete with fully custom wound yoke (!) Random Scan XY Monitor conversion and a little yoke winding. I'm now looking for a higher resolution tube, that one is 0.82mm dot pitch and doesn't look 'great', drop me a line if you know about CRT tubes. Decided to figure out another custom IC from the Atari/Midway/Namco hardware. The 03xx ( CUS03) custom IC as I had no idea what the thing did apart from it was something to do with the scroll function. Results of a few hours analysis. Custom IC 03 for Bosconian, Xevious and Pole Position. Next up is the Atari AVG in a Xilinx XC95108, this is a freeware project that I'll put all the details and source/schematics. Expect that soon.... ish.. Cleaning up the site again.. Need to add some project pages too after playing with old ZX-speccy stuff. Manic Miner is still a wickedly good game even after 20 odd years. 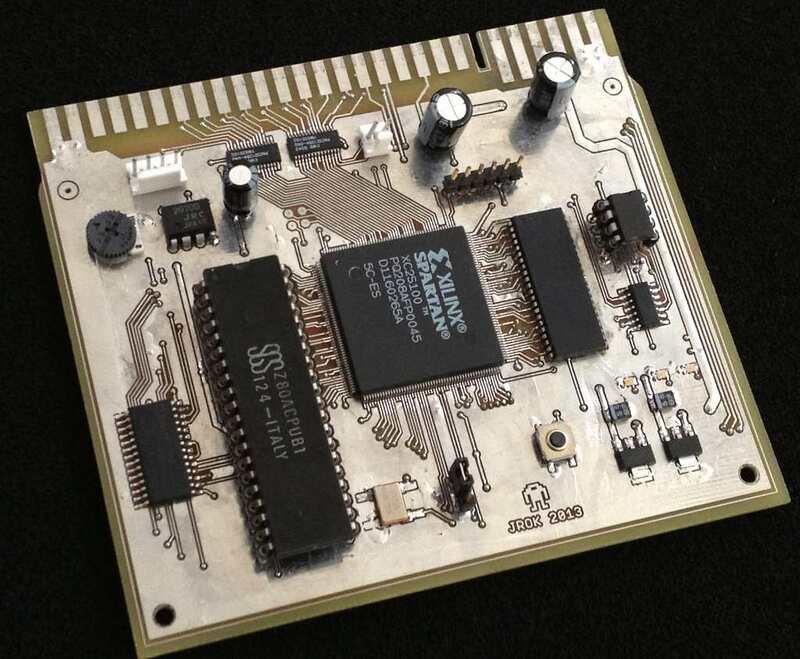 This was the custom micro-controller used on Pacland, Skykid, Rolling Thunder and on the later system 1 games. 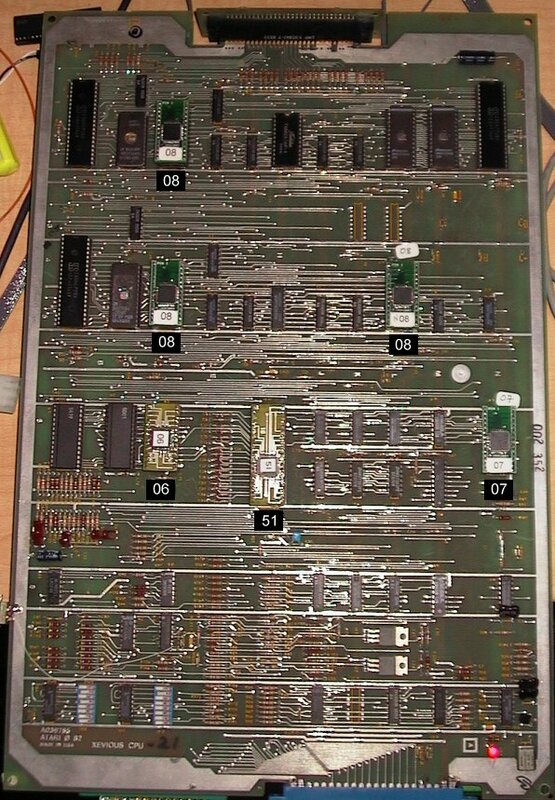 So after some messing around with 6301's here's a new page dedicated to the CUS60, 63 and 64. Include schematics for a replacement board, code patches and the source code. Wow.. two updates in a month (!) Who knows I might actually complete my ZX-speccy clone sometime in the next week as well. 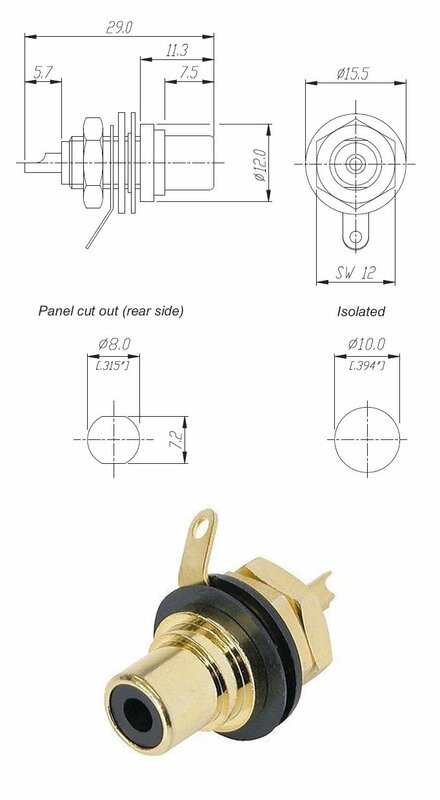 Also now have stock in for more of the gold plated panel mount phono connectors. Panel Mount Phono Connectors Available in Red, Green, Blue, Yellow and White. Golden Tee Fore 2005 seems to be becoming ever more popular as the prices for the boardsets decline. So I've been looking into the sync issues that affect some TV's when you run the boardsets with a video encoder. As things just can't be simple, testing has found that some TV's have been fine, others have rolled vertically and some have just freaked out in very funky ways. Under test at this very moment is a new sync-cleaner that should resolve the common problems. Except for TV's that just flat out reject anything other than a perfect 60Hz vertical sync. 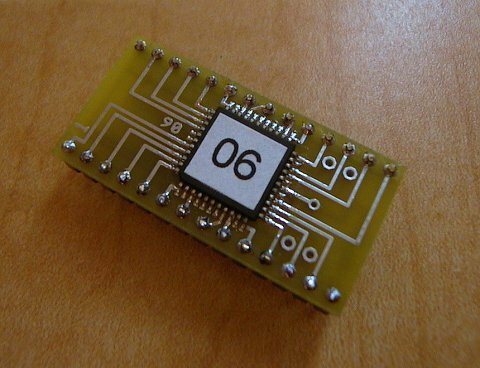 It's a small 1" x 1.25" board which goes in-line with the encoder and the sync-output from the game. It 'cleans up' the sync output from a game to the standard durations of the NTSC specification. It's not restricted to Golden Tee but will also work with other games that can have problems with some TV's, for example Primal Rage. Busy building more component encoders, email for pricing and availablility ! More details on them over the next few days. Wiring diagram and mounting templates to follow. As a few folks have asked ALL models the v3 and v4 encoders are available without the phono and s-video connectors to aid in panel mounting. Pics of a special project I didn't put up before The worlds smallest encoder ? Jan 1st 2006: Happy New Year !! After several requests I'm adding a lower cost component only version of the encoder. Click here to see the new encoders . One quick picture of next arcade product an RGB to video, s-video and component encoder. Click here to see the first production boards. Pin headers for all outputs, RGB pass through and it'll also be available in component video only form, if you don't need any of the other video outputs. Well.. I've finished a pretty big Oracle Apps implementation project which has absolutely nothing to do with Arcade stuff or games in general but has been taking up large parts of my life for the last 4 months or more.. But it's done, in production and working as well as Oracle apps 11.5.9 works in general. Now several thousand lines of customized code are done it's back to doing some updates to the site... oh.. and I got a CPS2 system.. hmmm.. not as much fun as the MVS tho'.... and I really need to put the CUS60 stuff up. Finishing up a new page all about the Namco custom IC the 'CUS60'. This is a modified Hitachi 6301 with a couple of new op-codes. The HD6301 is basically a super Motorola MC6801. This micro-controller has 4k of internal ROM and was used as the sound chip on a few mid to late 80's games like Skykid, Rolling Thunder and Metrocross. I'll be putting up the base schematics for a replacement carrier PCB plus the source code to make the replacement work just like an original CUS60. Apr 6th 2005: Custom IC 51xx Install guide, a GAL for Atari Rampart, Dig Dug Freeplay, Reactor Score saver ! Replacement GAL for Rampart ! Just finished a replacement for custom IC location 8M on the Rampart board, this is a 24pin GAL20v8 that's programmed to be an address bus multiplexer. The Atari part# is 136082-1004 . Mar 20th 2005: Xevious & Bosconian High Score Saver Kits ! Details can be found here Bosconian High Score Saver Install Guide and here Xevious High Score Saver Install Guide. The RGB to NTSC video TV encoders are still available and in stock. RGB to NTSC Video Encoder - Click to view ! Jan 1st 2005: It's a whole New Year !! Finishing off testing of a Xevious high-score save kit ( finally for those who've been asking ). Jun 12th 2004 : Hopping Mappy page added ! New LCD panel page, also added a link from the Arcade page on how to convert a Gamevue playstation panel to run with raw RGB + sync input. Really useful as a portable test screen for gameboards. Follow the link for details LCD panel fun ! Mar 15th 2004 : Two more custom IC replacements available !! The first few boards are made up ! As this is the initial run they're not as fancy as the others. No soldermask or silk screen, but they're fully functional and will be up for sale shortly. For Galaga/Bosco/Dig Dug/Pole Pos etc. It's the big 42pin IC that counts counts, handles control inputs and flashed the start buttons. Upclose and personal pic of the 5100. For Galaga/Bosconian/Dig Dug/Pole Pos/Xevious. 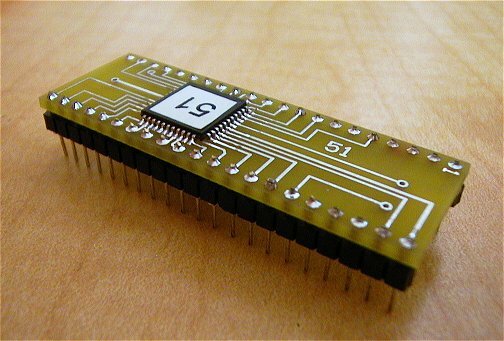 This is a 28pin interface chip between the system bus and the I/O bus. Custom IC 06xx Upclose pic. See the galaga & xevious pics for one in-place on the board. All the old news from years past is here !! These are my simulations of arcade machines, they emulate the original hardware of the games run the original game code. JAS emulation.